Does a Telehealth “Virtual Consult” Including Referring Physicians, Specialist Physicians and Patients Increase Shared Decision Making for Patients With Heart Disease? Background: Shared decision making (SDM) is highly recommended but difficult to implement for patients with severe heart disease referred for cardiac intervention. This study utilized telehealth (TH) to bring referring physicians and their patients together with a specialist physician to exchange treatment options and patient preferences via a triadic “virtual consult”. This study explores the impact of this innovative approach on SDM and patient decisional conflict. Methods: Two cohorts were included: usual care (UC) and TH. UC patients were seen in a clinic with one of 4 participating physicians, and visits were recorded. Telehealth patients met with their local referring physician in the office, and connected remotely with the specialist physician. One of two decision aids (DA) was used: HealthDecision, an electronic health record-integrated DA for atrial fibrillation, or AS Choice, a paper-based DA for severe aortic stenosis. Patient characteristics were collected via surveys. SDM was measured via Observer OPTION-5, a tool used to rate audio or video-taped clinical encounters, with raters’ agreement being assessed by the Bland-Altman analysis (2-rater pairs). Decisional conflict was measured by a 4-item survey, SURE. Data from two cohorts were compared using the Fisher exact test and the Student’s t test. Results: Twenty UC visits (5 per physician) were compared with 7 telehealth visits from 4 clinical sites. Patient mean age was 84.3 years and 52% were women. UC patients were older than telehealth patients (87.6 vs. 74.9, p=0.002). 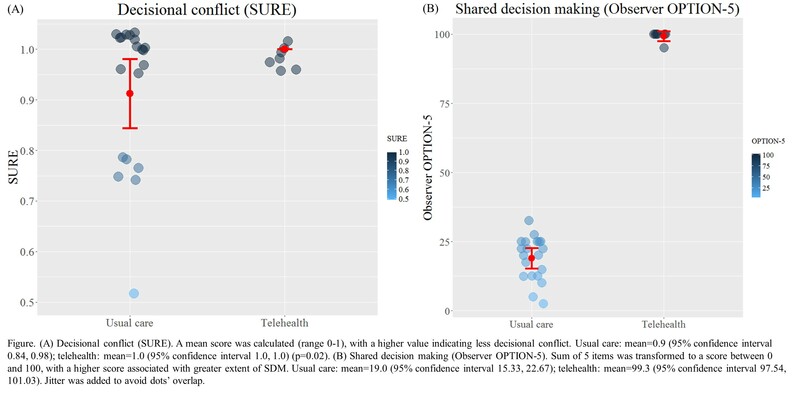 Patient decisional conflict was significantly different between the two groups (p=0.02). Telehealth visits had higher OPTION-5 scores than UC visits (99.3 vs. 19.0, p<0.001). (Figure) Rater pairs were used for each observation with evidence of lack of strong agreement in 2 pairs (95% limits of agreement in 3 pairs: [-6.0, 8.8], n=7; [-24.3, 20.7], n=11; [-34.2, 18.7], n=9). Conclusions: A combined clinical visit with both the referring and specialist physicians, along with their patient in a “virtual consult,” led to decreased patient decisional conflict. Higher OPTION-5 scores were suggested, indicating improvement in the presence of SDM; lack of strong agreement between raters limits this finding and larger studies are needed.